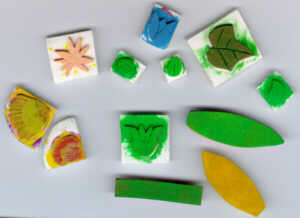 Make YOur Own Rubber Stamps - And $AVE! I have been teaching paint stamping for years, and I am always amazed at how many different ideas my students come up with for various items to stamp with. Click here to find a great collection of ideas! Making stamps from "scratch" is a fun, easy and inexpensive way to really customize anything. You can stamp on any type of surface. Cloth, paper, wood, door mats, walls, you name it, you can stamp on it. The amount of detail you can create is truly amazing if you have the patience to follow intricate lines and patterns. Scroll to the bottom of this page to see some samples of some more simple designs. Pattern Books: You can find patterns just about anywhere. 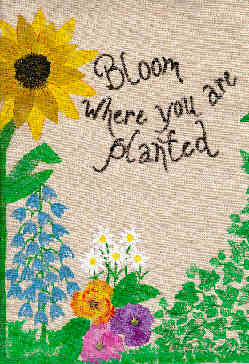 Iron on transfer books, seed catalogs, misc. books and magazines, fabric patterns, etc. 2) Using scissors, cut out stamp pattern being extra careful to follow lines exactly. 3) Cut Foam Core (if using) into a square, approximately 1/4 inch larger than stamp design. 4) Glue Foamie to Foam Core with Thick Designer Tacky Glue. Use a very thin coat of glue, place stamp design in place and press gently, but firmly, stamp side down to distribute glue evenly and smooth out any bumps. OR Coat Foam Core piece with a thin layer of Tack It Over And Over, and let dry completely. 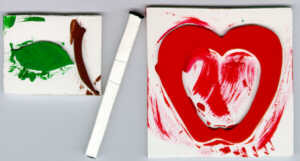 It will still be very tacky when dry, and you can use the same piece of Foam Core for several stamps of similar size. Simply press stamp image onto tacky area, stamp, and peel off when through. **If you do not wish to use Foam Core as a base, leave a rectangular "tab" on one end of your design, to hold on to when stamping. For leaf veins, wood grain, etc. you can score lines into the Foamie image at this time. Only cut about 1/4 into the Foamie. 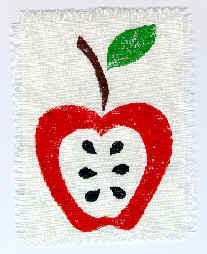 Details can also be added by double loading your stamp, or using fabric markers or paint pens once the image has dried. If using paint to create your image, brush selected color(s) onto stamp. The amount of paint will vary with the surface used. Paper needs less paint, fabrics need more, etc. You can double load your stamps for shaded effects. Practice on scraps until you have the desired effect before moving to your actual project. If using ink pads, procede as you would for any stamping project. YES, you can emboss with these! Preparing your surface is important for certain projects. Wood should, of course, be primed first. Fabrics work best when pre-washed. Floor cloths can be purchased with a gesso coating already applied. I have very seldom ever mixed a textile medium into my acrylic paints. As a matter of fact, I will often thin them slightly with water. This allows the paint to wick into the fabric, and I have never had a problem with paints coming off. As long as you don't apply the paint too thick, you shouldn't have a problem. For outlining, or adding dimensional accents, you would need to use a paint formulated for this purpose, or add textile medium to your acrylics to keep them flexible once dry. Fabric markers or paint pens work well to add extra details once your paint has dried. Always mark an arrow on the back of your stamp to indicate the top, or stem location. Break the image down into the different component parts and make one stamp for each piece. Simply overlap, or stamp next to the previous edge to create your design. Use Q-tips to clean areas of your stamp accidentally covered with paint or ink. Use Toothpicks to add details to stamped designs. 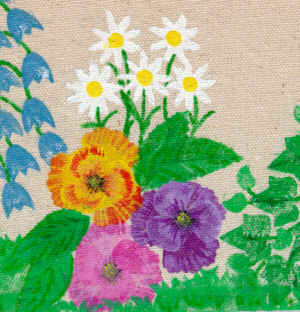 (see pansies close-up, below) Dip end into paint and place a small dot of paint onto design. Then scrape from center outward to create a striated mix of colors. This image was used on a tote bag I designed for teachers. The image was stamped all over the bag with sayings ( A+ Teacher, An Apple for my Teacher, etc.) hand written in "dot" letters with a black fabric marker. These are the stamps I made for the tote bag image. All are glued to a Foam Core background block for stability. You really should clean off your stamps when you're finished, but as you can see, I'm really lazy! This is almost all of the banner I created for one of my stamping classes. My scanner isn't wide enough to catch the entire image. (The finished banner is about 11" x 14".) The ivy, to the right, extends all the way up to the top of the banner, and the sunflower is complete on the left, not running off the edge. This is a close-up view of the flowers. The pansies were done by double loading the stamps, (two sizes of petals) and the center accents done with toothpicks. As you can see from the stamps themselves, they are VERY simple. I actually used the tulip shaped one for my grass! The sunflower leaves and stem were not glued to Foam Core. I didn't leave any tabs to hold on to because I LIKE getting paint on my fingers! No, seriously I am a messy crafter. I always seem to get paint on my hands, no matter what, so I didn't bother. Sometimes I wear latex surgical gloves, but they are a bit awkward when working with small items. The stem and leaf accents were drawn on with a fabric marker after the paint had dried. Now that you've seen how incredibly easy it is to make your own stamps, and SAVE ALL THAT MONEY, you are ready to enhance your world with handcrafted beauty! Please send me photos of you and your projects, I'd love to see how creative you are!!!! !